C/ Else Hetzel, s/n, 7458 Can Picafort, Spanje. Grupotel Alcudia Suite is located ust 200 meters away from Playa de Muro, the best option to spend some family holidays thnkas to its confortable apartaments at the north of Mallorca Island. In its cozy apartments and its nice pool, you will find a comfortable and familiar atmosphere. We would like to emphasize on the beauty of the white sand of Playa de Muro. Grupotel Alcudia Suite has received ISO 14001 certificate for being environment friendly. 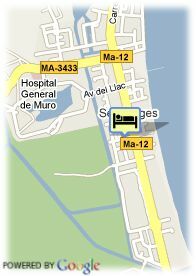 Its studios and apartments give customers more flexibility to organize their stay at Playa de Muro.